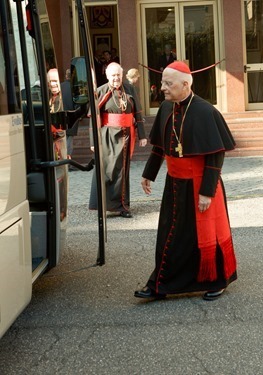 As you know, this week I departed for Rome to be present for the many important events that are taking place at this time and to prepare for the conclave at which we will choose the next Holy Father. 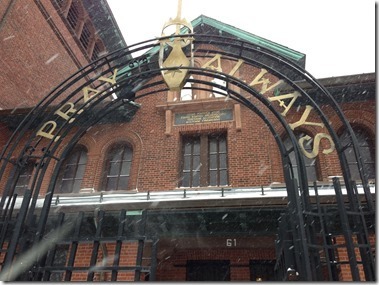 As I mentioned in my post last week, before I left for Rome I visited the Carmelite convent in Roxbury, particularly to ask for their prayers during this important time for the Church and for Pope Benedict XVI. I have been thinking about them during this time, and knowing that they are praying for me is a great consolation. 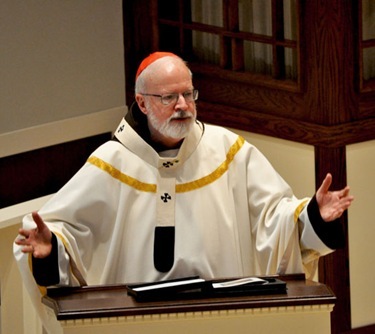 This week it has been my privilege to be present for many significant moments in the life of the Church, but before I reflect on those, I would like to share with you a few events that I participated in before my departure. 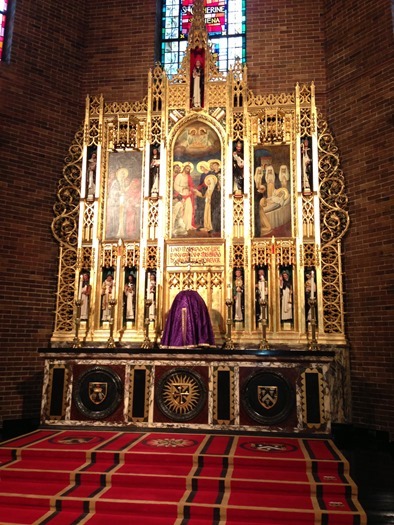 Friday afternoon I celebrated a Mass at Blessed John XXIII National Seminary at which five Boston candidates and several others received the admission to candidacy. Admission to candidacy is what replaced the former ceremony of tonsure, with which one entered the clerical state. 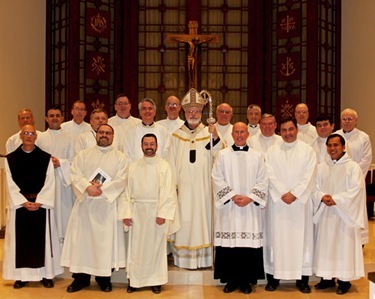 Though now with admission to candidacy seminarians begin to dress in clerical attire, they are not technically clerics until they are ordained deacons. 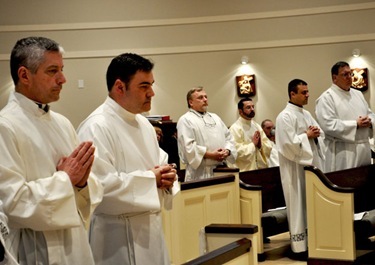 This and the other ministries before ordination are sacramentals that help prepare the men spiritually and are markers as they move toward ordination. 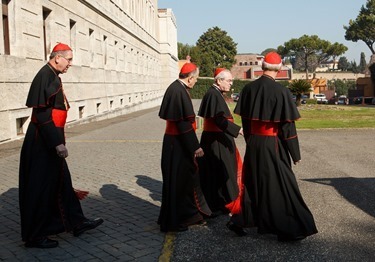 It is a time for a renewed commitment to the process of preparation for orders, and a sign of the seriousness with which the candidates must take the preparation for their vocation. 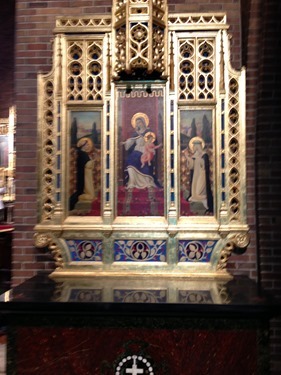 Sunday, I went to New York for a Lenten Vespers service at St. Catherine of Siena parish where Father Jordan Kelly OP is the pastor. 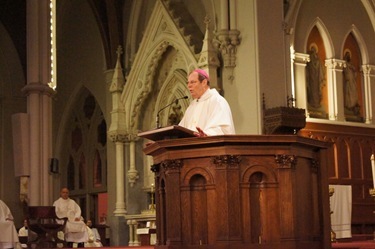 I preached on mercy and forgiveness as part of their Lenten series. 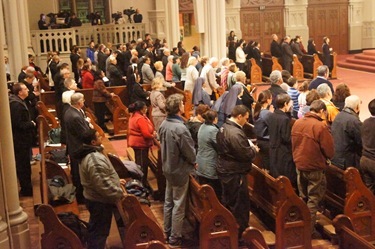 I returned immediately after that to Boston because the next day we had a Holy Hour with the staff to pray for the upcoming conclave and the Holy Father, at the Pastoral Center. 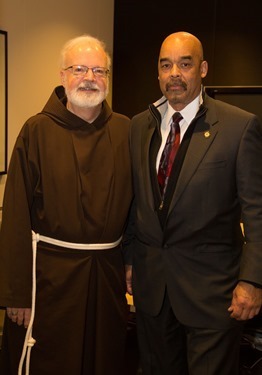 In the evening, I met with leaders of the Catholic Lawyers Guild of the Archdiocese of Boston. 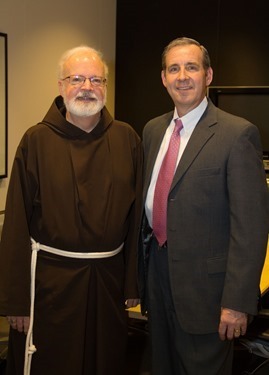 We discussed a number of issues including the planning of this year’s Red Mass for members of the legal profession and what some of my hopes are for them during this Year of Faith. We also discussed the pro bono work which is being done by the Lawyers Guild and ways that this may be expanded going forward. 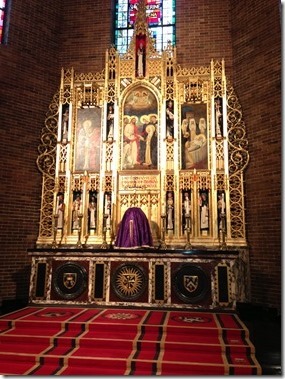 Tuesday, I departed for Rome. 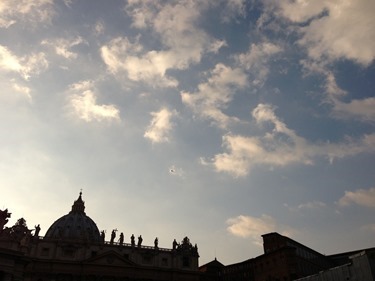 When we arrived at the airport, we learned there was a problem with the flight and there was a concern that we would not be able to make a connection in New York that would bring me into Rome in time to meet with the Holy Father. The people at Logan Airport went to great lengths to find a flight more assured to arrive on time. 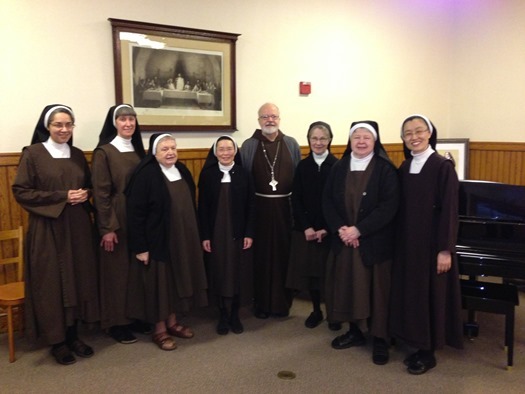 They were very gracious to us and I am very grateful to them for all their help. 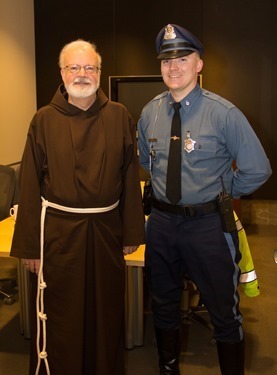 As I was waiting for my plane, I had an opportunity to greet several of the workers and law enforcement officers. Finally they arranged for us to take an Air France flight into Paris. 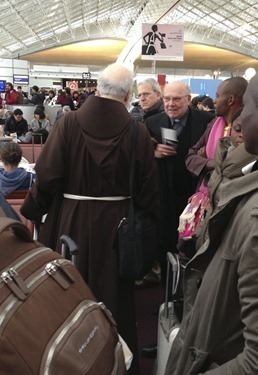 It was a nice surprise to see Cardinal Levada at the airport in Paris. 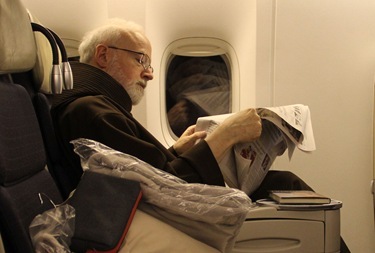 He was on the same flight to Rome on the second leg of our journey. 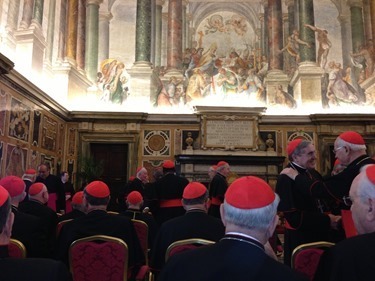 While in Rome awaiting the conclave, we are staying at the Pontifical North American College with the rest of the Cardinals from the United States. 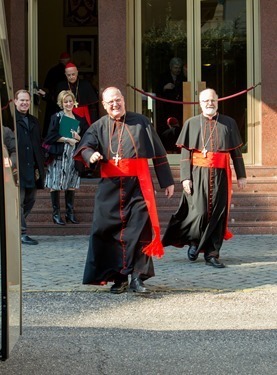 Thursday morning we departed together for the meeting with the Holy Father in the Sala Clementina. 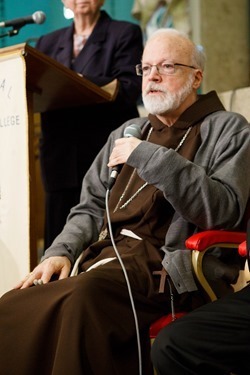 The Holy Father gave us a brief address and then each of us had an opportunity to speak with him personally to thank him and bid him farewell. The Holy Father’s words to us were very touching. 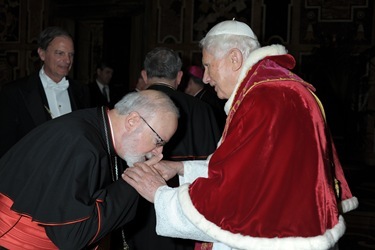 He told us that he is looking forward to the election of the new Pope and that he will put himself at the new Pope’s disposal with all obedience, respect and reverence. 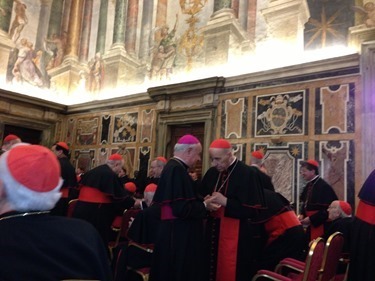 He also spoke to us about the mystery of the Church and the need for unity among the Cardinals, comparing us to an orchestra which is made up of different instruments but must be played in harmony. 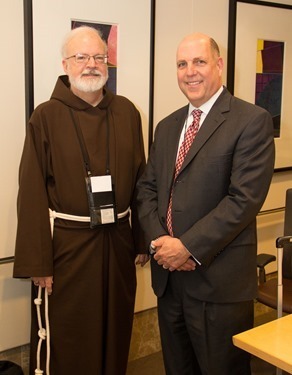 When I spoke to the Holy Father, I assured him of the prayers of the people of Boston. I told him how much we love him and are grateful for all he has done for us, and I assured him of our prayers moving forward. 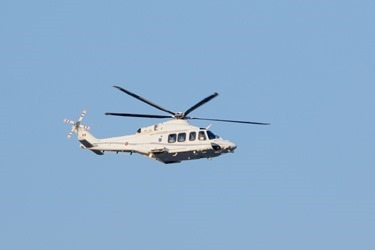 In the afternoon I went to St. Peter’s Square to witness the Holy Father’s departure by helicopter. There were many thousands of people there waiting to see him take off. 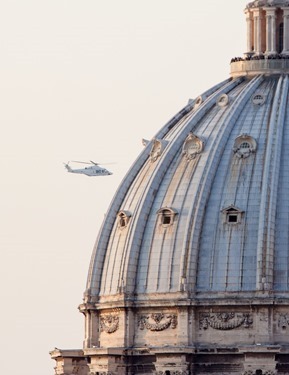 There were many cries “Viva il Papa!” and, when he flew over, there were many flags laid on the ground so that the Holy Father would see them from the air. 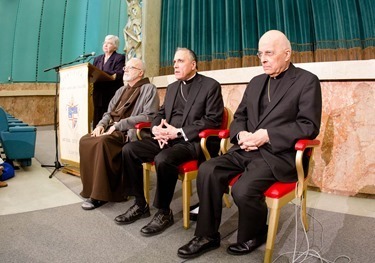 That evening we had a press conference back at the North American College where Cardinal George, Cardinal DiNardo and myself answered questions for the media, all of which I thought were good and very thought-provoking. One in particular was a question by John Allen of the National Catholic Reporter. He asked us what we would be doing at 8pm, the time when the “sede vacante” actually began. At the time we answered that we were probably be having dinner or meeting with friends. 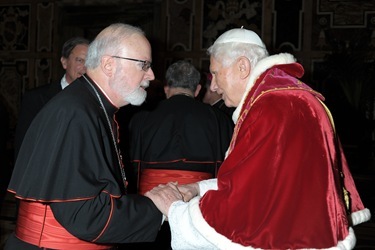 For most of us, I think, until he brought that to our attention, the meeting earlier with the Holy Father, and witnessing the takeoff of the helicopter had been so much of the focus of the day. 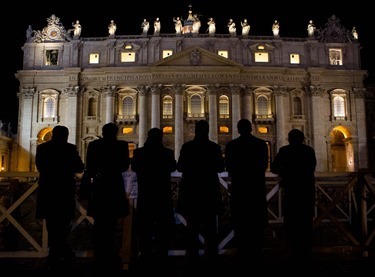 However, the question did make me think and as it turned out, at 8 p.m. we were watching television, witnessing the closing of the Apostolic Palace and we stopped and said a prayer for the Holy Father. 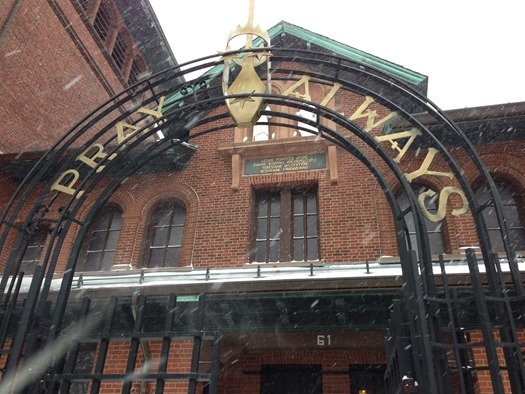 Back in Boston churches rang their bells for the last eight minutes of Pope Benedict’s pontificate, one minute for each year of his papacy, as I requested before I left. The Pilot ran this story on their website that I want to share with you. 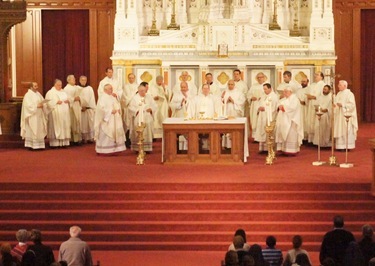 At the Cathedral of the Holy Cross, back in Boston, Bishop Deeley celebrated a Mass of Thanksgiving for the Holy Father that evening at 7:30, Boston time. 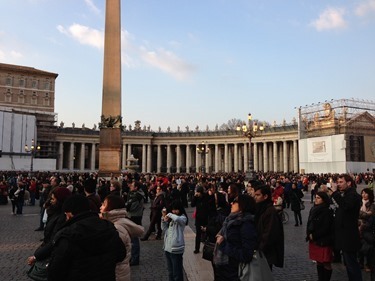 I heard it was well attended, and it was an opportunity to mark the end of Pope Benedict’s pontificate and to pray for him as he begins, in his own beautiful words, the last leg of his pilgrimage on this earth. 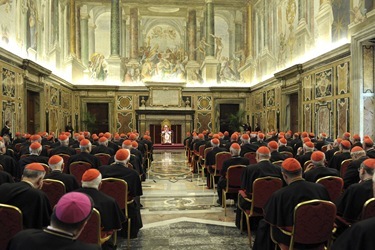 We are living through very momentous times in the life of the Church, so I ask now for your prayers that the Holy Spirit will inspire us as we will gather soon in conclave to elect our new Holy Father.